When I come across a recipe that is tattered and food-splattered, I know it must be good! This ice cream pie recipe is one of those worn slips of paper in my recipe box; it is truly an oldie but goodie! Sometimes, I make a simple homemade graham cracker crust, but I have been known to use store bought for a quick dessert. For a nutty, delicious, gluten-free crust using almond meal (pictured above), follow this link. Store-bought chocolate sauce is fine, too, although I have a delicious recipe for homemade Salted Hot Fudge Sauce if you are inclined. It is easy to make and what I often use in this dessert. Perfect over vanilla ice cream and given as a gift in a Mason jar. 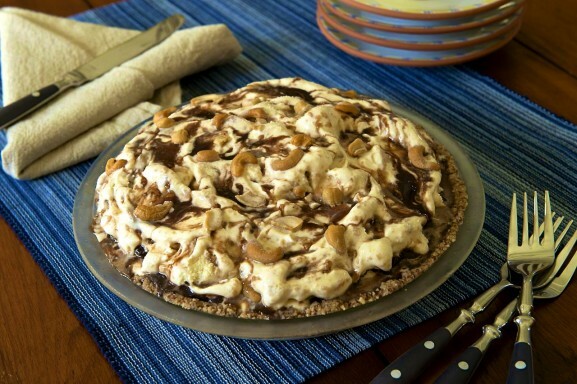 My sister-in-law, Mary, is a Snickers fan so she has made this pie with chopped Snickers instead of cashews. I recommend either version! I have learned over the years that it is helpful to prep this dessert in two quick stages, simply freezing briefly after the first layer. On a hot day, this will prevent melting ice cream from oozing over the sides of the pie plate and making a mess! If you make your own pie crust, make sure to cool it completely. If your kitchen is warm, you may find it helpful to chill the crust prior to adding the first layer of ice cream. Combine the peanut butter and honey in a small bowl. Place the softened ice cream in a large mixing bowl, and then stir in the peanut butter-honey mixture. Spoon half of the ice cream into the pie crust. Spoon the remaining ice cream mixture into the pie crust, and then top with the remaining cashews and chocolate. Garnish with whipped cream, additional cashews, and/or chocolate sauce, if desired. This recipe was happily shared with Sunflower Supper Club’s Weekend Potluck and Mandy’s Recipe Box. Oh yum! I have many of those food splattered recipes myself and you are right – they are always the best ones that I come back to time and time again. This looks so amazing! The more stained and ragged, the better: ) Thank you for the nice comment, Valerie! Would it be okay to use natural peanut butter in this recipe? Or is it just worth it to go all out with Jif? Oh my Ann! This looks fabulous! My family is going to love this (as well as me!) I think I gained 5 pounds just looking at the picture. I’ve pinned it. Thanks so much for being so faithful to our little ole Weekend Potluck. Hope your having an awesome week! Thank you for comment, Kim. Your weekend potluck is always a treat, and I am glad to be a part of it! Good morning Ann. Just wanted to let you know that I picked this as my personal favorite from last weeks Weekend Potluck. My kids are dying for me to make this! Can’t wait to see what you bring this week. Have a terrific weekend! That is terrific, Kim…thank you! I can’t wait to stop by this weekend. There are ALWAYS so many delicious recipes and I enjoy looking through the collection! I am so going to make this! YUM! I hope you love it as much as we do, Heidi! This is a wonderful combination of my favorite flavors. Pinned to try soon! Homemade ice cream would be divine, Ann! Thank you for pinning the recipe, and I hope you love it as much as we do!